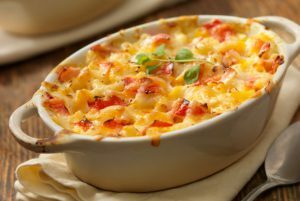 In honor of National Mac And Cheese Day, Try this delicious recipe! Bring heavy cream to a boil in a medium saucepan. Reduce and add mustard, bay leaves, cloves and cook 5 minutes on low heat. Remove cloves and bay leaves. Add roux and cook for an additional 5 minutes, then add cheese, salt, and pepper and whisk until the cheese is melted and well combined. Copyright © 2019 The Abbey Group. All rights reserved. This institution is an equal opportunity provider.